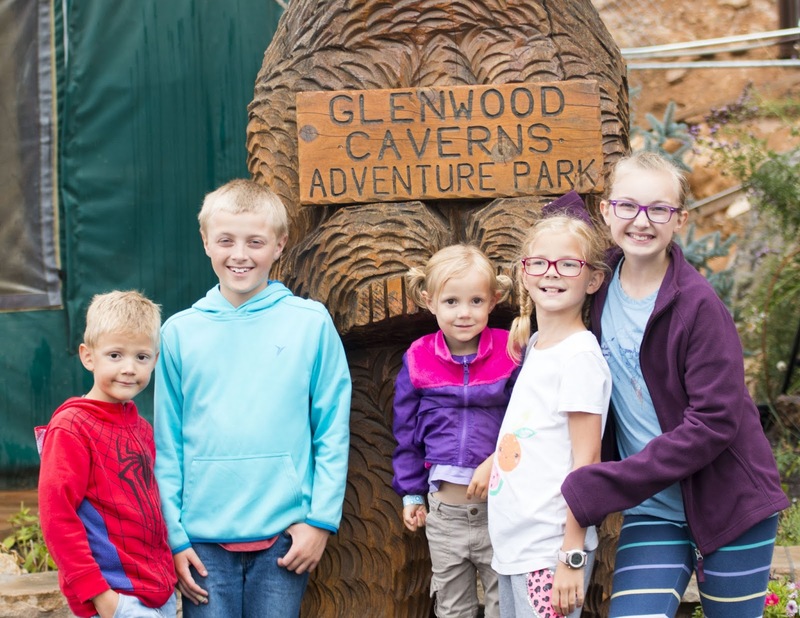 We decided to spend our last full day in Colorado visiting Glenwood Caverns Adventure Park. 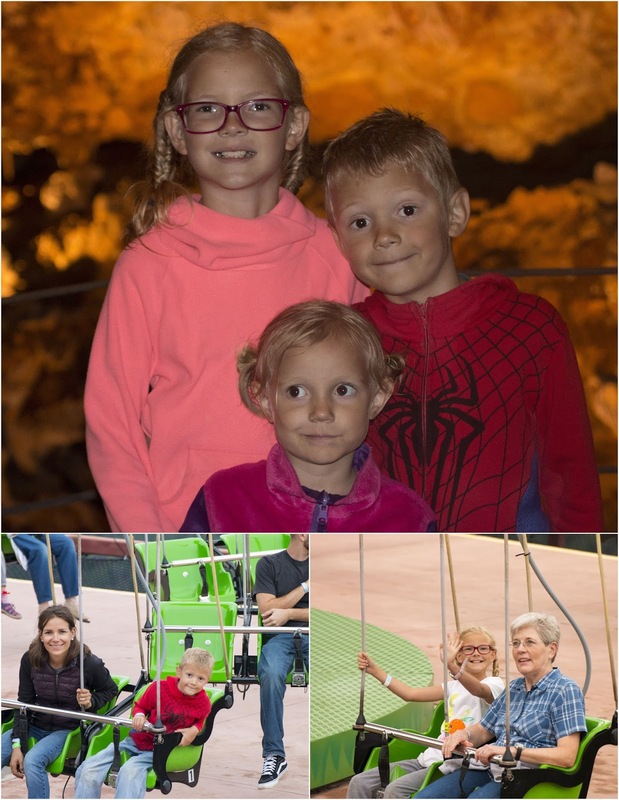 My kids had never been to an amusement park or ridden any rides except those at the city carnival each summer so this was quite an experience for them. We began by riding up to 7,100 feet on a Gondola to reach the park entrance. The kids were a little apprehensive about the ride because of the altitude. The view out of the window would be scary for anyone afraid of heights. As we were trying to decide where to go, the kids took off to ride the Giddy up Wagon and to climb into the SpeleoBox. The box is a series of narrow and curved tunnels built to simulate cave exploration. Stella was too young based on the posted age but was so eager to follow her older siblings that I couldn't refuse her. I crawled behind her just to make sure she was OK. She was the perfect size for it. Often times she had to pause either to wait for someone else ahead of her to continue forward or to 'show' me how I should climb through a particularly tricky area. Afterwards we headed over to the Wild West Express Coaster. 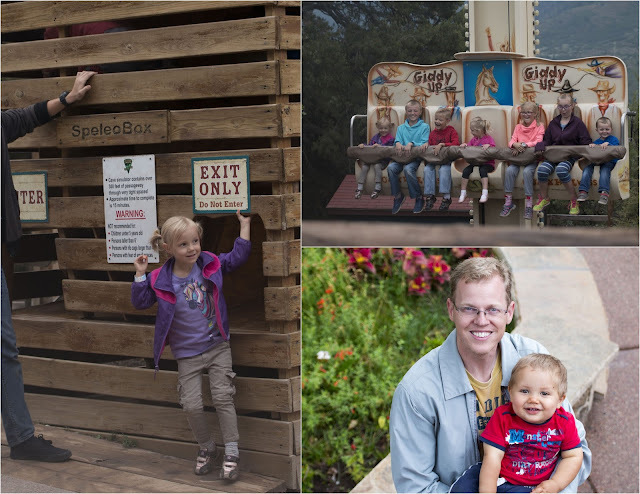 A kiddie roller coaster that was perfect for Stella. There were many rides she could not go on because of her size but the Wild West Express was not one of them so she rode it with me, Todd and grandpa countless times. Especially as the rest of the group waited in line to ride the Soaring Eagle Zip Ride. 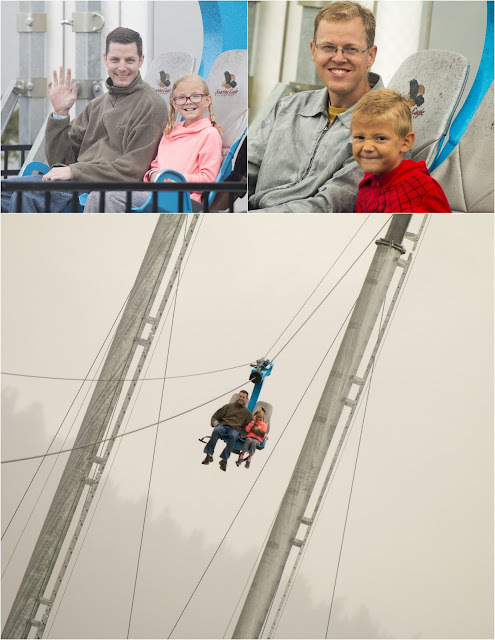 The ride pulls the two passengers up an additional 625 ft up the mountain and then releases them to soar down to where they started. The weather up to this point had been overcast, but while most everyone was waiting in line a pretty heavy rainstorm came down getting everyone wet. Emilia rode the zip line with uncle Scott while I held Andrew and took photos of everyone. She later rode it again with me. I was expecting something more exhilarating (a.k.a. terrifying) but the zipline never got too fast and I felt pretty safe during the entire time. After everyone got through riding the zip line, we decided to wait out the storm by doing a cave tour, which were on the completely opposite side of the park. Once we arrived and got in line someone noticed that my 3 year old nephew was missing. Somehow in the shuffle of people he was left behind where we had just been. His mom and dad took off looking for him while the cave tour operator radioed a description of the little boy to the park staff. Fortunately he was found relatively quickly, although the poor little guy had been crying not knowing where to go or what to do. By this point, Andrew also was exhausted and crying. We could not get him to calm down and there was not sufficient time for him to fall asleep before our tour began so Todd decided to stay behind with him while I took the three older kids through it. Many of the formations had been named based on what their shapes resembled. For example there were a Santa, Snow White, a castle, and plenty of cheerios. The caves used to be the main attraction to the park until 15 years ago, when the property owners decided to add amusement rides as well. There are several thrill rides on the park that are even more terrifying because of their placement right against a mountain cliff. 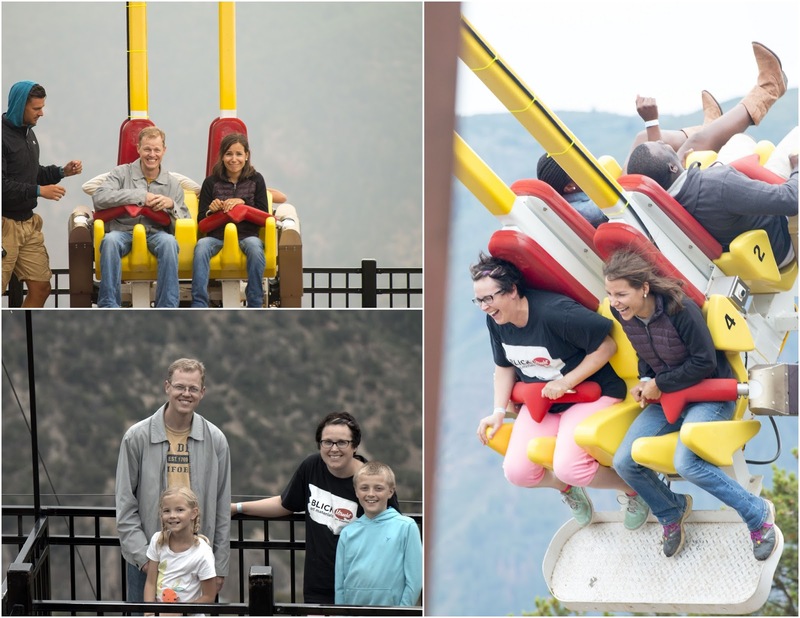 The Giant Canyon Swing is definitely the scariest. It is a big arm that swings back and forth with two seats facing forward and two facing backwards. I rode it a few times. Maybe it's because it was my first time riding it, but for me the backward facing swing which propels you down towards the mountain side at full speed was a lot scarier that swinging up towards the open valley and sky. I mentioned to Emilia that there were two girls who kept going back on the ride. She thought that because these girls found it entertaining it wouldn't be too scary. 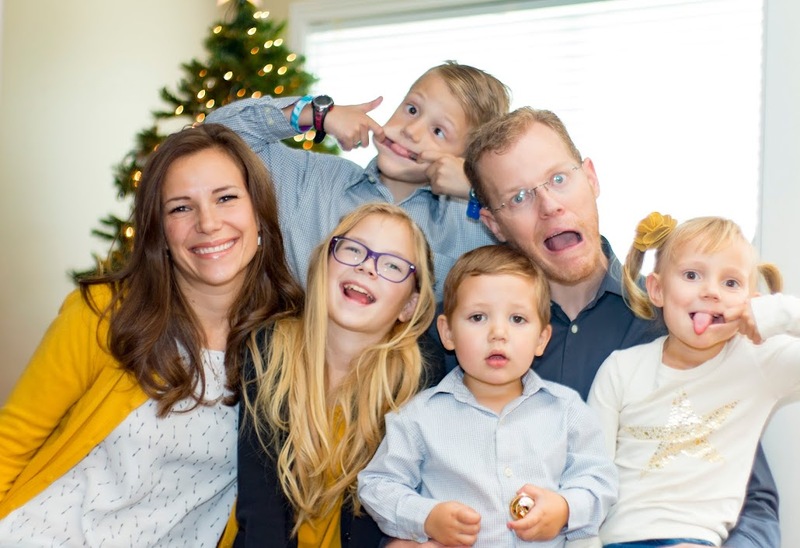 So Todd, Emilia, her cousin Graham and his mom decided to try it. Well, it was a lot scarier than she imagined. She was pretty shaken up by the time she stepped off of the ride. 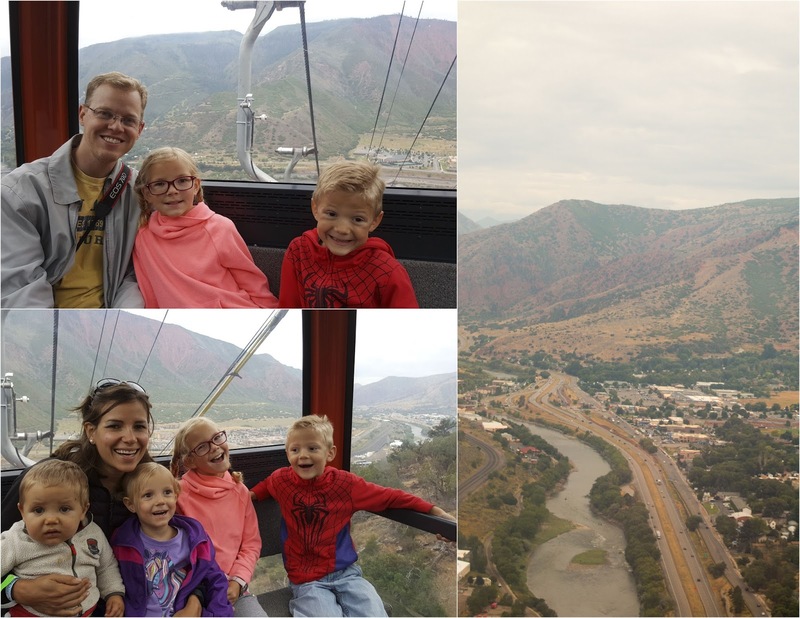 The Glenwood Canyon Flyer is a giant swing that circles around a center post shaped to look like a tree trunk. For part of the ride we were swinging 1,300 feet over the canyon. The views were amazing and the ride not at all frightening except none of the adults could manage to go on the ride a second time because we cannot stand spinning without getting sick to our stomach. 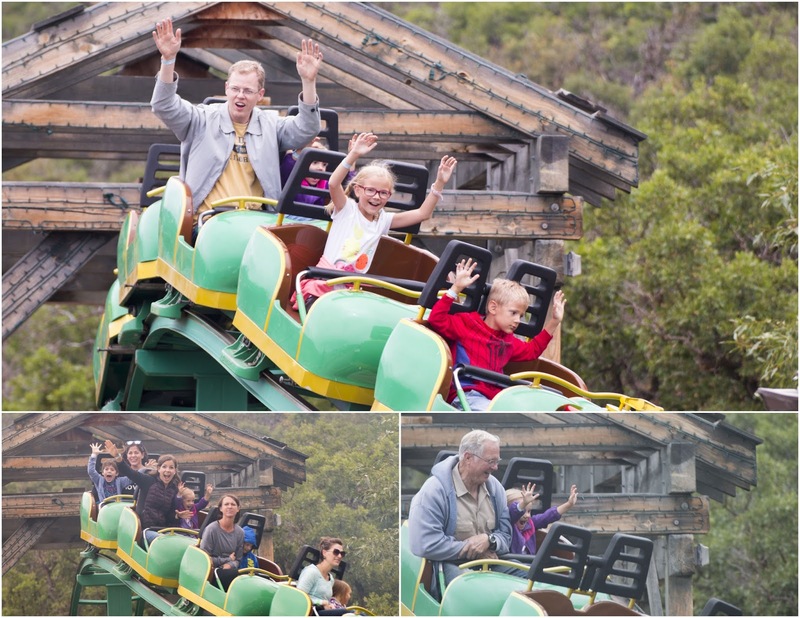 The Alpine coaster was also a popular ride for the family. Unfortunately I have no photos of us riding on it. The coaster uses gravity to travel downhill on a winding track. The driver manages the speed of the vehicle so you can go as fast or as slow as you wish. There was a young boy who was allowed to ride his own ride but soon after he began his descent it was obvious he wasn't ready to do it alone. It took FOREVER for him to complete the ride, which meant he slowed down everyone else behind him to the point they close the ride for at least 20 minutes waiting for him to finish what should have taken 5 minutes. Needless to say, one of the people riding behind him lost his temper and the boy's mother who was also on the ride was pretty upset with everyone and was yelling at the man when they finally made it back up to the top. The adventure park was probably the most memorable thing about the entire trip for our kids since that is something we have never really done before.